Media mogul Hung Huang is a pivotal figure in the Chinese fashion industry. Not only did she start the successful local fashion magazine iLook, but she is also the founder of the world’s largest Chinese designer multi-brand store Brand New China. She is so influential in the media that she has been referred to as the “Chinese Oprah”, but she is now making her mark on the fashion industry by becoming one of the domestic design industry’s most influential proponents and key players in its development. Hung Huang offers some surprising advice on what to do and not to do to successfully launch your brand in China. As a place where many brands have failed despite a huge potential market, China still presents many challenges and hurdles to foreign brands trying to capitalizing on its large population and purchasing power. “DON’T: Have a runway show in China — it’s a fine idea for publicity, but don’t expect Chinese buyers to show up. They don’t exist yet. Similar to Japanese designers in the 70s and 80s, many Chinese brands are staging shows and participating in tradeshows in Paris for branding purposes, as the market remains undeveloped in Mainland China. Wanting to redefine “Made in China”, pioneers like Hui Shan Zhang and Masha Ma are making names for themselves and defying stereotypes both at home and abroad. In an insightful analysis of the Chinese government’s historical and current relationship with fashion, Hung Huang speculates whether or not China’s first-lady-to-be will be included on the world stage; furthermore, there are high hopes from the domestic industry that she will be and can help promote China’s fashion industry. In her new weekly feature on WWD, media mogul Hung Huang discusses the state of Chinese fashion, and describes what she calls a “zen” style coming out of China. She cites Exception de MixMind, Wang Yi Yang’s Cha Gang and ZucZug, as well as rising star Uma Wang as top designer brands coming out of China. BNC’s 1st Anniversary Fashion Show featured designs from Uma Wang, Cha Gang, Pari Chen, Chictopia, Luvon by Liu Lu, May J., Ricostru, and many others. The article also includes extensive quotes from Pari Chen, as well as Angelica Cheung of Vogue China and Uma Wang. A one-hour live debate on the future of the Chinese fashion industry, with a specific focus on development of domestic talent like Vega Wang. An interview with Hung Huang about the lack of a domestic luxury industry and a vision to cultivate it. After opening BNC, Hung Huang boldly lists who she believes are China’s top 5 fashion design talents. Hung Huang explains the catalyst for opening her own store featuring Chinese designers and the response she’s received after opening BNC. “Sanlitun Village hoped to have Chinese designers open up shops in the North Village, so they asked me to attract some designers, which I thought was great. But when I went to pull in some local designers, I discovered they didn’t really have the ability to open their own stores. The NYTimes explores the origins of the name and logo for BNC, which was designed by graphic designer Liu Zhizhi. He and Hung believe that there is a transition happening from simply ‘Made in China’ to ‘Designed in China’. At the very beginning of her brave leap into the worlds of fashion and retail, Hung Huang discusses how first generation designer Wang Yi Yang inspired her to take on the cause of promoting the domestic industry. 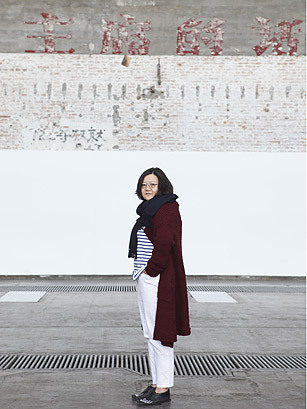 [Hung] calls the relationship between her company and Chinese designers a weak-weak alliance. Unlike the Chinese editions of Vogue, Elle and Cosmopolitan, iLook doesn’t have access to globally franchised content or long-established ties with luxury brands. The designers are young, creative talents who lack the funding and experience to build businesses and brands. “[The Western fashion magazines] eat the meat, and we get the soup,” she says. But the soup might turn out to be pretty meaty. China’s luxury-goods market is expected to grow by 15% in 2010, leading the global market, according to a report by consulting firm Bain & Co. Big fashion brands like Chanel are using more Chinese models at their runway shows, and Liu Wen, a Chinese model, became the first Asian face of Estee Lauder earlier this year. Many believe the timing is ripe for China to have its own Issey Miyake and Rei Kawakubo, the Japanese designers. “This designer managed to bring the fashion sense of my childhood to the 21st century. I was deeply touched,” she writes in the Editor’s Note in the March issue of this year, which was dedicated to Chinese designers.